How can I use my national characters on audio tags? Mp3 Tag Assistant Professional - one of the first audio taggers with complete UNICODE support for tags, playlists and filelists. You can open audio files with national (UNICODE) characters on audio tags and our software correctly will show this information (see Figure 1). You can create, change, delete, copy audio tags with national (UNICODE) characters, import these characters from XML, TXT and CSV files, export to XML, TXT and CSV files and playlists. The program interface support UNICODE characters also. 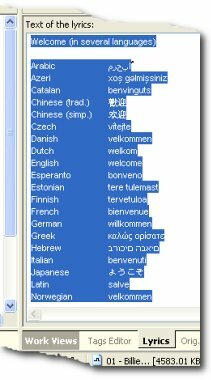 Using Mp3 Tag Assistant Professional you can use your national characters: diacritic symbols, umlauts, hieroglyphs easily and simply! The some audio tag format can't support the UNICODE characters. For example, ID3v1 tags for MP3 files. We recommend to use ID3v2 tags for UNICODE support. WMA and M4A metadata and some other tag types support national (UNICODE) characters also. You must change settings of the program if you want to use national characters. Open program Settings dialog (press the "F9" button). 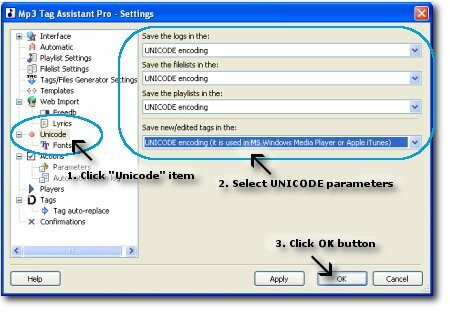 Select "Unicode" tree item (see Figure 2) and change encoding for new tags, playlists or filelists. Select "Font" tree item (see Figure 3) and change the program interface font. This font must support your national characters. We recommend to use "Arial Unicode MS" font. The program uses a system default font by default. This font does not support the all UNICODE symbols. Hint: you can find "Arial Unicode MS" font using Internet search. Hint: if you have Microsoft Office 2000 or FrontPage 2000 you can get the "Arial Unicode MS" font, which is the most complete. To get it, insert the Office CD, and do a custom install. Choose "Add or Remove Features". Click the (+) next to Office Tools, then International Support, then the Universal Font icon, and choose the installation option you want. 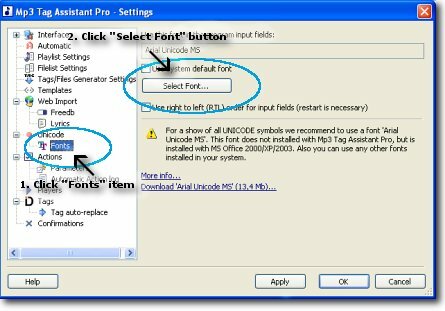 Hint: if you have Microsoft Office XP/2003/2007, Visio 2003/2007 or Publisher 2002 you can get the "Arial Unicode MS" font, which is the most complete. To get it, insert the Office CD, and do a custom install. Choose "Add or Remove Features". Click the (+) next to Office Shared Features, then International Support, then the Universal Font icon, and choose the installation option you want. The font "Arial Unicode MS" (© Microsoft) is a complete Unicode font, containing all of the approximately 40,000 alphabetical characters, ideographic characters, and symbols defined in the Unicode 2.1 standard. How can I use ANSI characters on audio tags? © May 21, 2008 by AssistantTools.com. All rights reserved.